As Debenhams announces its plans to revitalise the company, it is a good time to assess how the retailer’s brand perception has held up over the past year. YouGov’s data points to a brand that is still well regarded, but is struggling to be unique and standout against rivals on key metrics. Our brand tracking data shows that Debenhams is behind competitors such as John Lewis and Marks and Spencer in terms of quality – while it has around the same score as House of Fraser. A fifth of current Debenhams (22%) customers say that having the best quality product is one of their key purchase motivations – so losing out on this score hampers the brand. It is a similar story when looking at overall Impression score (whether someone has positive or negative impression of the brand). As may be expected, Marks and Spencer and John Lewis are way out in front in the high street retail sector. Both lead Debenhams by over 17 points, which is in turn 8 points ahead of House of Fraser. Our data indicates that current Debenhams customers are far more likely than the average to be customers of M&S, John Lewis and House of Fraser. Therefore, it’s reasonable to suggest that this particular consumer will be well placed to judge the changing strategies of each brand. And if one is to lag behind, they will notice and act accordingly. 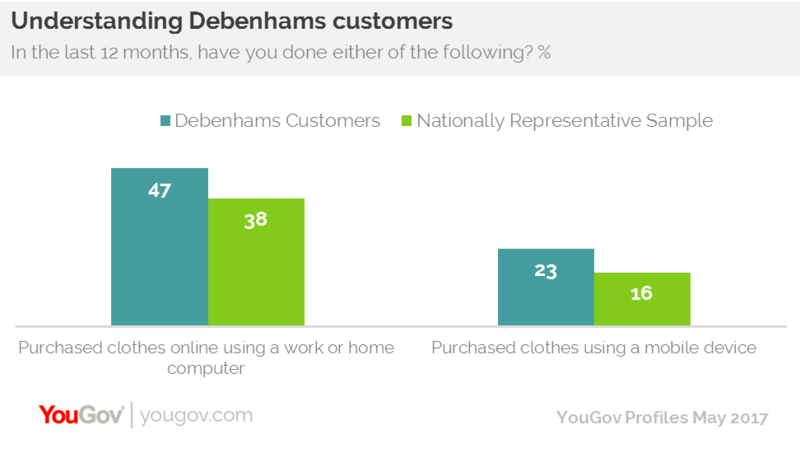 Debenhams has at least recognised that many see its offer as outdated by placing greater emphasis on online sales. YouGov Profiles data underlines the evolving purchasing behaviour of the brand’s customers. Of those that have bought something from it in the last 12 months, approaching half (47%) have bought clothes online using a work or home computer, compared to 38% of the general public. Additionally, 23% have purchased clothes using a mobile device (compared to 16%) of the public. To drive offline sales, consumers still need a reason to visit a store. In Debenhams’ case, it hasn’t been doing enough to clearly communicate to consumers why it is different and what separates it from its high street competitors. We have already seen BHS disappear from the market after the brand became stale and didn’t offer consumers a clear proposition. While Debenhams appears to be a long way from that, no brand is too big to fail once the public falls out of love with it. Rejuvenating and modernising the brand should be the focus then over the next 12 months – as well as focussing far more on changing consumer habits and tailoring the brand to them.